I have been desperate to visit Burger & Lobster for a while now and when they opened one on Dean Street in Soho, a mere thirty seconds walk from my office, I was absolutely thrilled. Burger & Lobster has been on the must visit list for bloggers, foodies and just generally anyone who eats for a while now and it’s yet another one of these places with a lot of hype and a no booking policy. This can only result in one thing: queues. Every time I tried to get in there it was jam packed and the wait too long. In the meantime friends and colleagues were somehow managing to get in and absolutely raving about it. I was getting jealous. I seemed to be the only person in the world who hadn’t been to Burger & Lobster. On payday I resolved that I was no longer going to be left out and decided to go straight from work and wait as long as it took. On arrival we were told it’d be a 20 minute wait or we could eat at the bar. Excellent! I was straight in! There is very little choice in Burger & Lobster, it pretty much does what it says on the tin, you can either have the burger, the lobster or a lobster roll. Each option is £20. I had been determined to have the lobster when I visited, thinking ‘£20 for a lobster and all the sides?!.. Bargain!’ … However being seated at the bar I figured it was going to be a bit awkward and messy trying to get stuck into that and so went for the lobster roll instead. I had also planned to sample a cocktail while I was there but took one look at the hefty prices and opted for a (marginally) less heftily priced glass of wine. Now I don’t really mind paying the price tag for something special or for the experience of trying something new, but when they were all cocktails I wasn’t sure I’d like, I didn’t want to fork out nearly a tenner and end up not drinking it. My first note about Burger & Lobster: drinks are expensive. My lobster roll came and it was incredibly well presented and really impressive. Arriving on a metal tray with a generous portion of fries, a side salad and a garlic butter dressing this was a very pretty meal. The fries were good, nothing ground breaking here but certainly done well, and absolutely gorgeous dipped into the garlic butter. The brioche bun of the lobster roll held everything together really nicely, this is certainly not one of those sandwiches that fall apart the second you poke them. The lobster was dressed and seasoned beautifully and I squeezed the lemon wedge provided over the whole lot for an extra kick of flavour. Even the side salad gets a thumbs up. 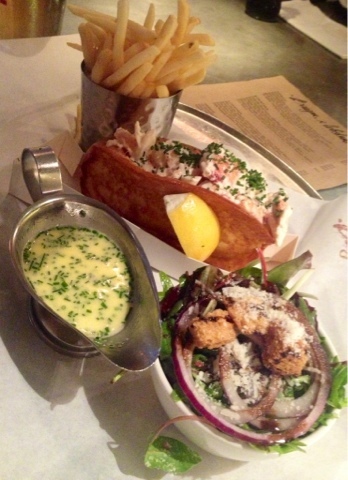 Now back to the lobster roll… There is no denying Burger & Lobster were generous on the meat. The roll was absolutely stuffed and the meat was fresh and came in large chunks. This was definitely a sandwich of the gourmet variety. I enjoyed my meal but I must admit I felt as if there was something missing, for some reason Burger & Lobster didn’t quite reach the wow factor for me. I can’t help but feel its because I didn’t go for the grilled lobster, it would have been much more of an experience and much more of a spectacle and I guess that’s what you really are visiting Burger & Lobster for. I’m resolved to go back and have the lobster but again it’ll have to be a payday treat as in spite of the casual feel to this restaurant, this is not a place you can just pop in for a quick reasonably priced dinner.